Ｋarta's Subjects masterpiece 50 installment of such Kenji Miyazawa fairy tales and poetry. Kenji Miyazawa and the world, creative version painter with a hot interest and deep knowledge of the Northeast folk events, etc. that lead to it, Takumi Ito is finished in colorful Carta of multi-color woodcut. 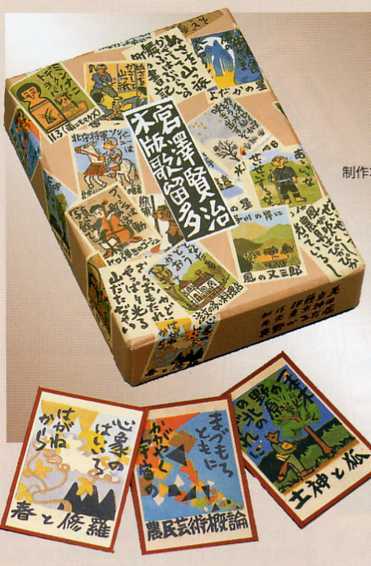 The multi-color printing of handmade woodcut is reproduced in offset printing, luxury goods and finished in the same backing process as luxury Hyakunin Isshu. Outer box has also become a Japanese clothing finish. Copyright © カードの履暦 All Rights Reserved.